Discuss the family problem of today. The family is a unique social and natural institution. It refers to a related group of members, related by blood or affinity (by marriage) under one roof. As such, the family is one of the most fundamental units of society. As a social constituent unit, it tends to affect the activities and the pattern order that usually prevail in society. 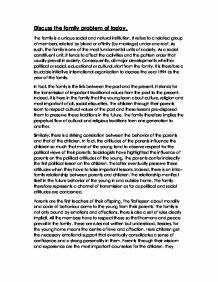 Consequently, all major developments whether political or social, educational or cultural, start from the family. It is therefore a laudable initiative international organization to decree the year 1994 as the year of the family. In fact, the family is the link between the past and the present. It stands for the transmission of important traditional values from the past to the present. Indeed, it is here in the family that the young learn about culture, religion and most important of all, social etiquettes. The children through their parents learn to respect cultural values of the past and these lessons pre-disposed them to preserve these traditions in the future. ...read more. The first lesson about morality and code of behaviour come to the young from their parents. The family is not only bound by emotions and affections, there is also a set of rules clearly implicit. All the members have to respect these so that harmony and peace prevail in the family. These are rules not written but understood. Besides, for the young home means the centre of love and affection. Here children get the necessary emotional support that eventually consolidates a sense of confidence and a strong personality in them. Parents through their wisdom and experience are the most important counselors for the children. They advice the latter about their careers, for school leavers are likely to go out and ask their parents what type of job they would do. Interestingly enough every family irrespective of its culture or religion pursues on the one hand economic progress and material comfort as a pledge of prosperity and security. ...read more. It merely implies the end of communication between parents and children. Where this problem arises, family suffers at large. Indeed, in frustrated family members are invariably associated with hooliganism, vandalism and other social offences. However, we cannot confuse social problem with family crisis. For instance, drug addiction is a major social problem that does not start from family. On the contrary, it is a problem that owes its root to social vices that eventually affect family. Luckily, there are family therapists who possess expert knowledge to deal with the family problems and to find appropriate solutions to overcome them. A family has a great deal to offer to society. Indeed to quite an extent, the pattern of social behaviour is closely related to the standard of life in the family. In other words, there is a remarkable correlation between the family and society. All major developments and trend of progress should start from the family. One of the major challenges today therefore is to find appropriate solution to the family problems that arises. In fact, a happy family is a necessary prerequisite to a peaceful and harmonious society. ...read more. Technological advancement has worsened the problem of poverty. Do you agree? This is particular important with major news like the tsunami in 2004 and cyclone Nargis that hit Myanmar. Help was needed immediately to attend to the injured people and getting rid of the debris. Countries that do not have the necessary resources will face difficulty in doing so and hence required foreign aid. This is done by sketchy and untrustworthy drug dealers and can result in addiction, sickness, or death for the curious teenager. These physical side effects result from the normal teenage curiosity for drugs. By removing this curiosity in a safe way, this class prevents such dangers from occurring. The average British child is spending thirty-six hours watching television; while only spending thirty hours in school. Studies have shown that most children between the ages of two and fifteen have a television in their room, which remains unmonitored by guardians, allowing questionable content to be viewed by impressionable minds (Mail online, 2006).